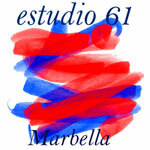 What town is Estudio 61 based in? what is the studio’s web site? The prize winner would receive a painting day to be taken any week day from 10.0am to 4.0pm with lunch included. They could paint in oils, acrylics or watercolour. The prize would include all art materials. Prize to be taken before December 1st 2011. This entry was posted in Open Mind and tagged art, personal development. Bookmark the permalink.